Under Muhammad ‘Ali Pasha, Cairo expanded and Bulaq was incorporated into the city proper. 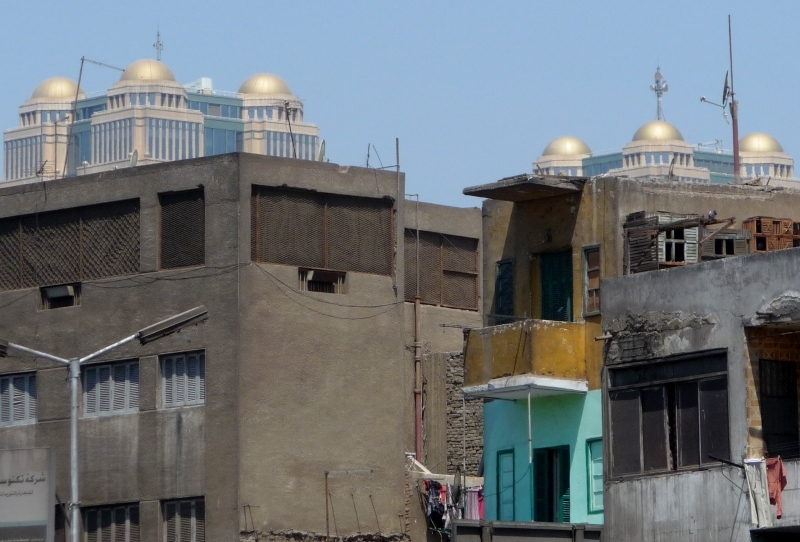 As modernization became the word of the day and European-style neighborhoods like Garden City and Zamalek were developed, civic planners increasingly regarded Bulaq as an archaic remnant of pre-modern times, with its narrow streets, unmaintained buildings, and non-elite population. 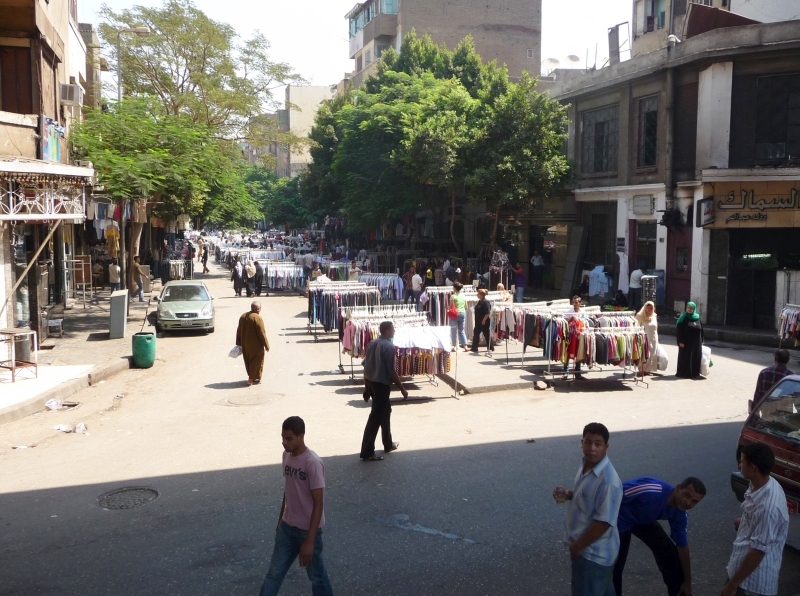 Throughout the twentieth century, Egypt attempted various industrialization and modernization projects in an effort to ‘revitalize’ Bulaq (which happens to be adjacent to the tourist-riddled downtown area.) However, these attempts have often proceeded with little regard for many inhabitants’ desires to remain in their historic locale and without concerted effort to bolster Bulaq. 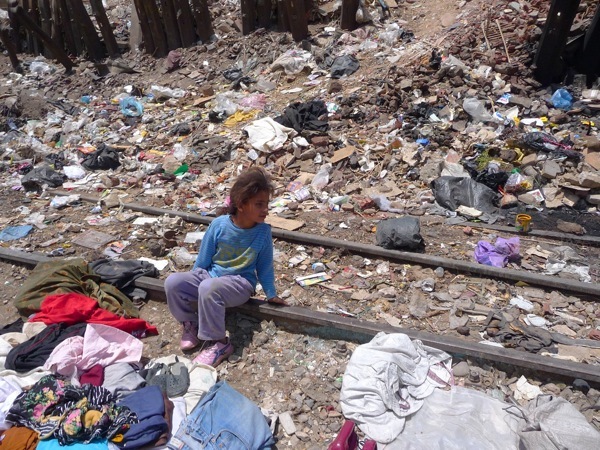 Under Sadat, over five thousand residents were relocated to al-Zawiya al-Hamra on the outskirts of Cairo but the land they vacated remained unofficial parking lots for fifteen years. 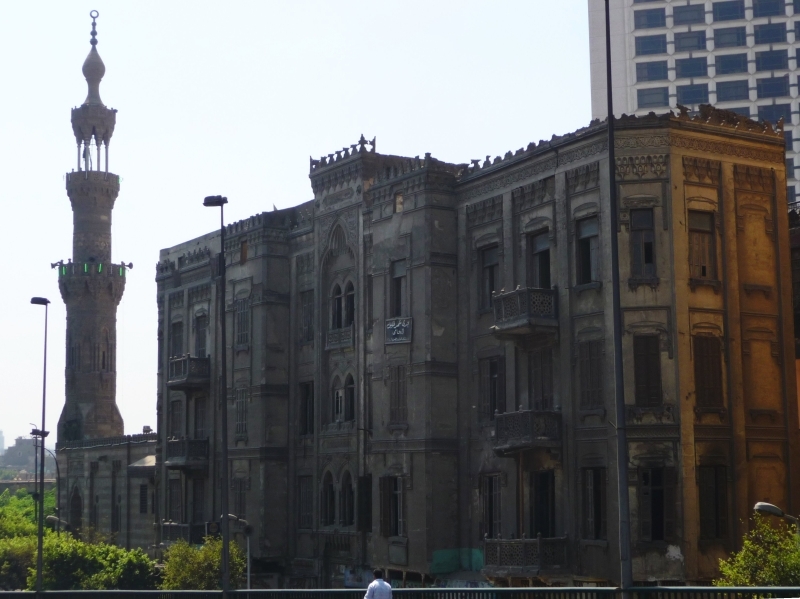 Today Bulaq remains a juxtaposition of structures and customs spanning centuries. Inhabitants congregate on the banks of the Nile and at venerated shrines like dozens of previous generations, then pass by Egypt’s second largest mall, the towering Arkadia, as they return to their homes. Mamluk mosques abut 19th century apartments with lacy ironwork balconies, while shops underneath sell electronics and motorcycles from around the world. A side note: for those not familiar with the Arabic language, the headline of this post demonstrates the complexity of transliterating Arabic letters into Latin letters. The name of the district in Arabic is بولاق, and a search for Bulaq, Boulaq, Bulak, Boulak, Bulac, and Boulac will all turn up relevant information. 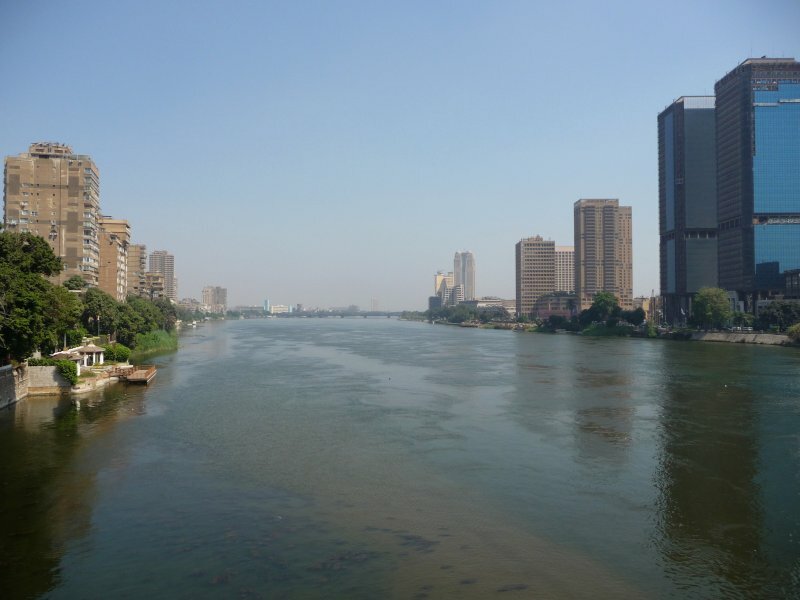 Large cities often have a body of water nearby, and the Nile is the artery that feeds Cairo. 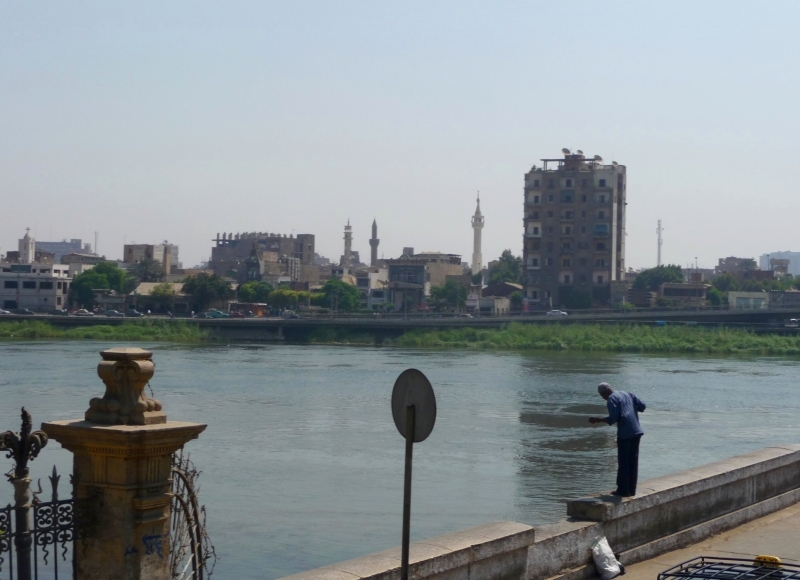 As large as the city is, when you cross a bridge over the Nile the buildings are momentarily dwarfed by the swath of water cutting through its center. Bulaq has a great mix of architecture. Some of my favorites buildings are the tall, delicate, 19th century structures now used as both apartments and businesses. 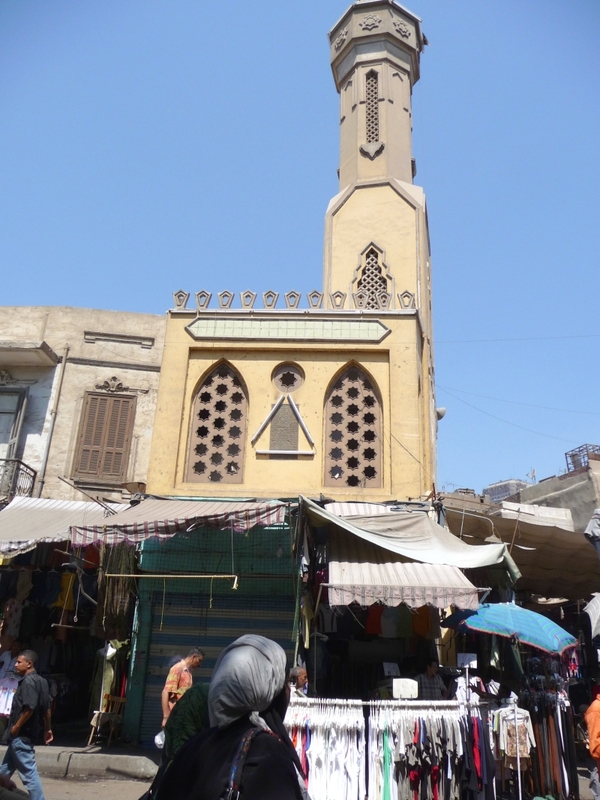 There are also a number of small, Mamluk and Ottoman era mosques with incredible stonework. Today, these buildings are towered over by the less-exquisite architecture of the large hotels and office buildings constructed in recent years. 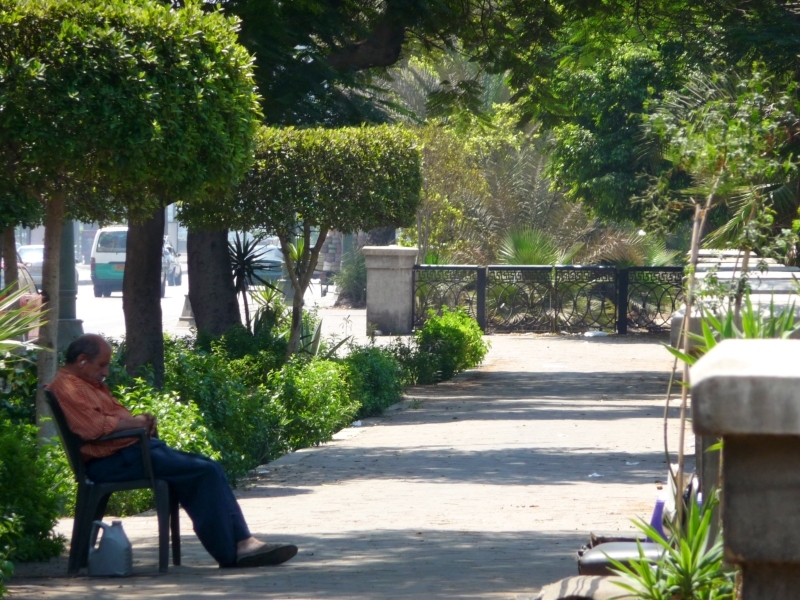 Summer in Cairo means the days are long and hot, so outdoor activities get started early. When we reached the market around ten, things were set up and people milling about. 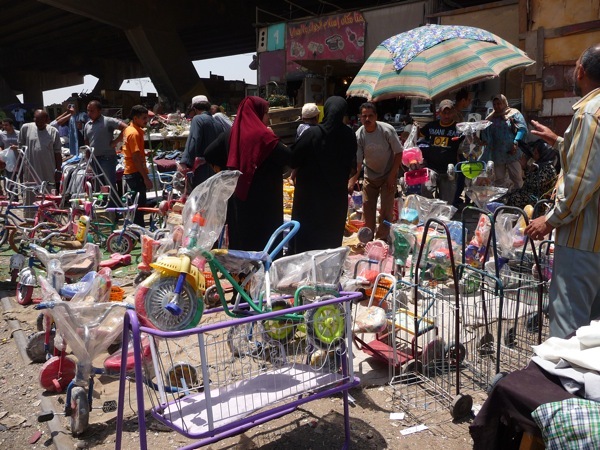 On Fridays, various streets around Cairo will be closed to automobile traffic in the morning as vendors fill the streets with produce and household goods for people to do their weekly shopping. The vendors with shops on the closed streets set up outside as well as mobile sellers offering wares. The first area we passed through was the clothing section, with stacks of shoes and racks of garments. This is a tiny mosque tucked in next to a small flat. 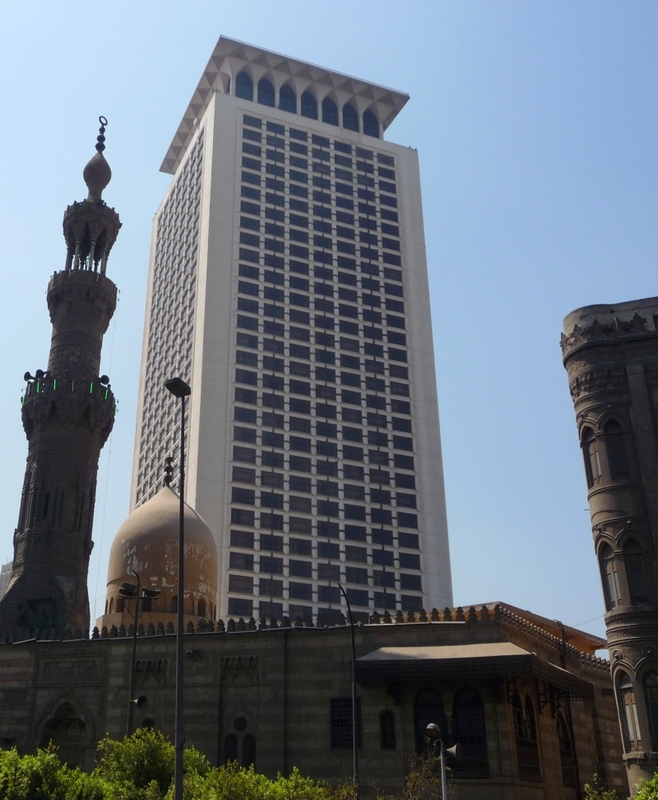 Mosques are abundant in Cairo, and range from the massive mosques and minarets of Ibn Tulun and Sultan Hassan to single rooms off the street with loudspeakers attached to terraces, like the one next to my old flat in Dokki. After the clothes came the household goods. 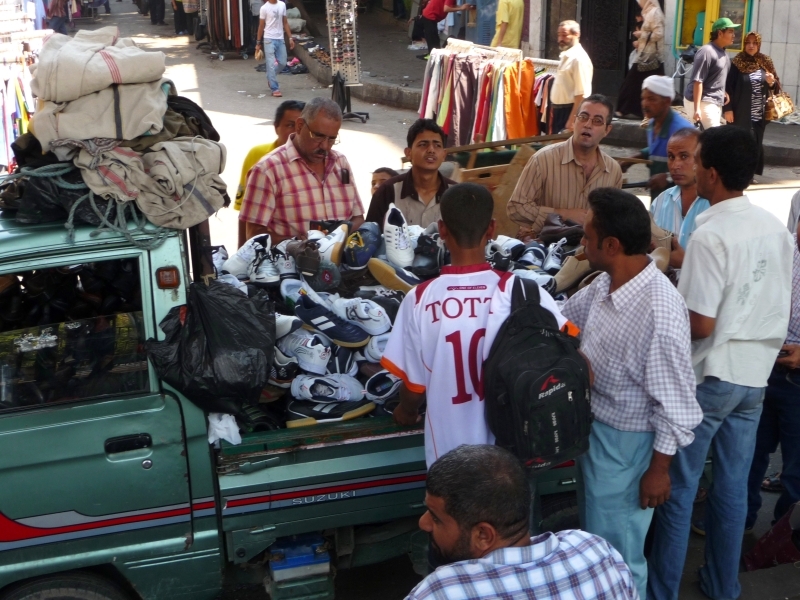 Some shops in Cairo can be extremely specialized. When I first arrived and lived in Bab el-Luq, I spent the good part of an afternoon searching for a shop that sold nails. Instead of a general hardware store with everything from nails to car fresheners, the wide variety of goods is dispersed among a number of vendors throughout the neighborhood. After inquiring at numerous tool, metal piping, bracket, and chain specialists, I was finally directed to a small, half-open, dutch door behind which a man sat on a stool with three walls of jelly jars within arm’s reach. All he offered were nails, screws, and hooks, but in every imaginable style and size. At his shop, I found exactly what I was looking for. This style of shopping can initially be confusing to one who isn’t familiar with the terrain, but I find it is much more enjoyable to meander around a neighborhood running errands than to spend the day in a mall or Carrefour. This shop specializes in metal kitchenware. Containers, trays, lunch tins, and teapots will all be found here, but not silverware or plates. 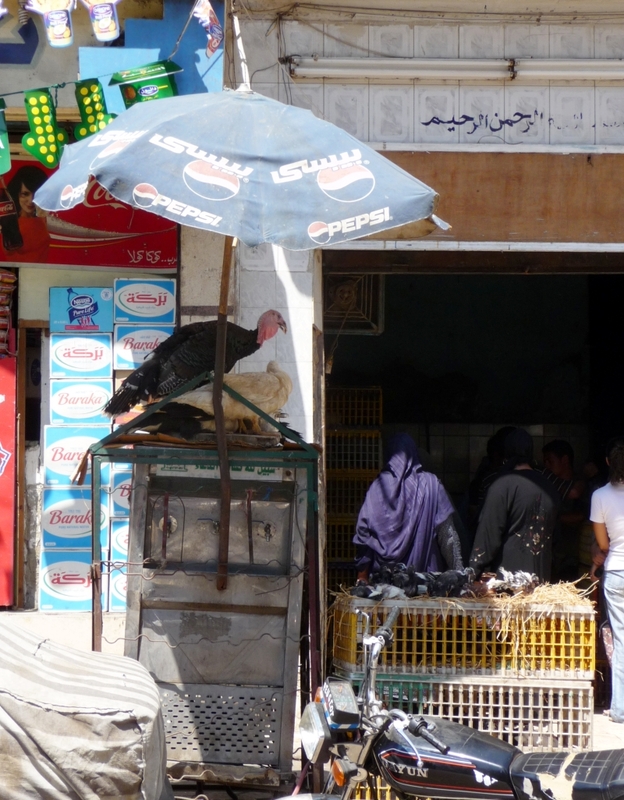 Notice the wooden structure above the shop which houses hamam, or pigeon. I also like the shop sign with the motorcycle and the baby. Next up is the food area. Both prepared foods and staples are for sale. 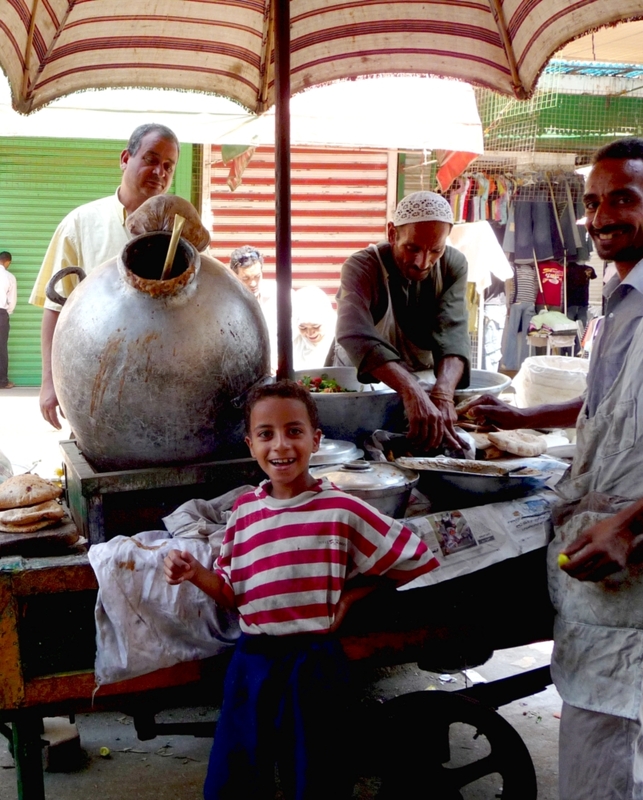 This photo is of a fuul vendor and his charming son, Ahmed. The large, round, metal vat is called an idra and contains the fuul, which is made of fava beans, onions, garlic, and spices simmered overnight. The fuul is served up in a variety of ways; one can add lemon, chili or garlic sauce, tomatoes, fried egg, cumin, and many other trimmings to complement the beans, which often come with a side of salad and bread. A big, tasty, filling meal generally runs between two and five Egyptian pounds. Pocket sandwiches to go will set you back twenty five to fifty piastres. Yum! A little further down the road we came upon a man with only a small basket of tiny, colored chicks at his feet. Dyed pink, blue and orange, these little fuzzballs were ridiculously soft and delicate. I never did figure out why they were dyed, but we had a fun time playing with the chicks and the young kids clustered around the miniature fowl. The specialization of the vendors continues into the food section, where farmers with small plots of land or a single commodity can set up a stand and attract customers. It is very much like a farmer’s market, as we would call it in San Francisco, but without a premium for the novelty. The diversity of items offered can be greater at the Friday markets, rather than local grocery stands, with items like fresh spinach, dill, and artichokes making special appearances. In general, it’s much better to get produce at outdoor markets and stands, as the quality and variety is usually much better than that offered at corporatized supermarkets like Metro and Alfa. 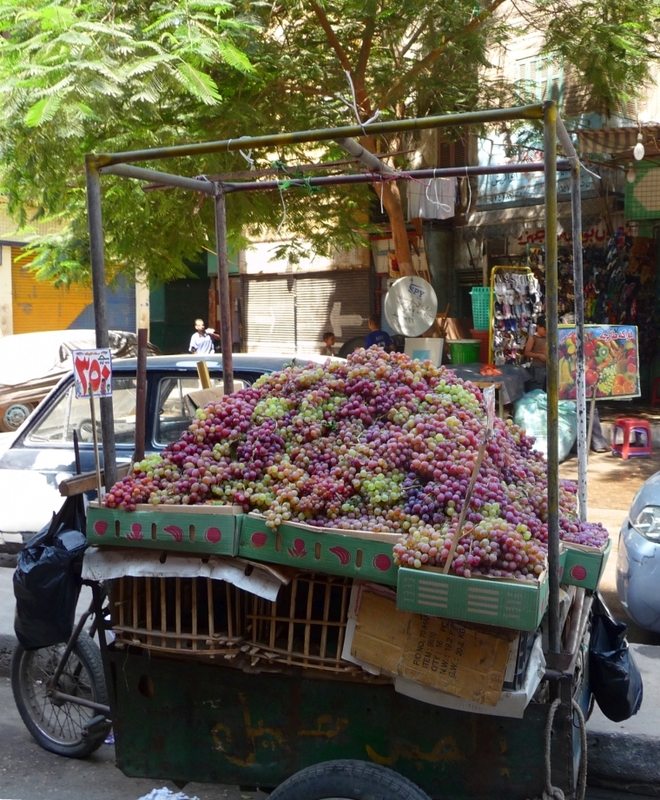 Plus, you might get to shop at a mobile grape stand! Prices are always listed per kilo on small signs, like the red and white one below, but always in Arabic. It’s easy to learn the digits 0-9 in Arabic, and knowing them really makes any shopping experience more pleasant (plus you don’t look like a donkey for asking the price when it’s clearly listed!) These grapes are 3.50 guineas for a kilo, a pretty sweet deal as that’s less than 0.50 usd and in a supermarket they can run up to 8 or 9 guinea per kilo. Fresh meat is available both prepared and *really* fresh. Live fowl, rabbits, and sometimes sheep surround shops where customers can inspect and purchase them. As I have not done this myself, I don’t know if the animals are taken home alive or if the shop is also for butchering. 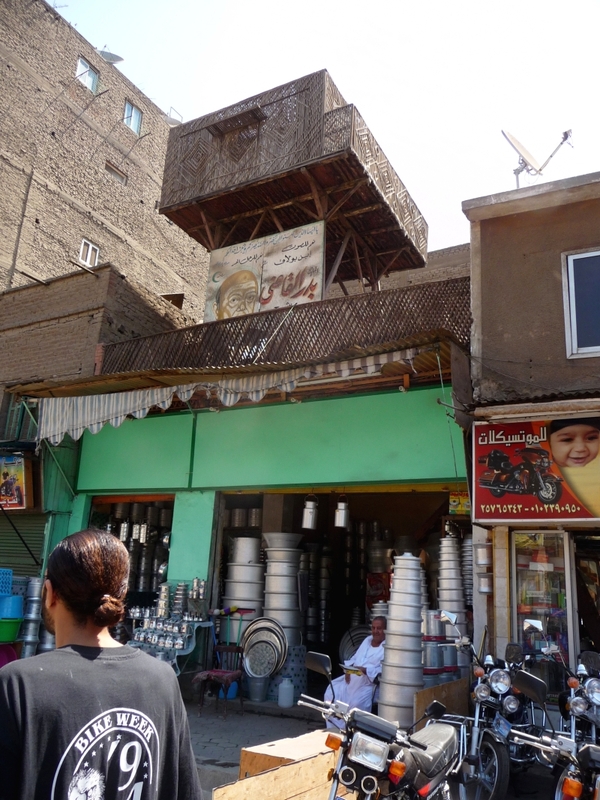 Towards the end of the street, the market tapered off and we came to an industrial section of Bulaq. In this area, one finds lumber, metal sheeting, and tools, both at shops and with mobile vendors. In the cart below, shovels, hoes, rope twine, and other building supplies are offered. The umbrella attachment is an important addition when one is sitting in the sun all day, and if you look closely you can see the vendor sitting behind his cart. At the end of the market street there was a little roundabout, something that will always remind me of New Delhi. Both cities have a history of British construction eras, although the novelty was exported with varying success. In New Delhi the roundabouts are a free-for-all and you must go with the flow, weaving across constantly moving lanes of traffic. In Cairo, the large roundabouts (most notably Midan Tahrir and Talaat Harb) are regulated by traffic police, which does create traffic jams but I’m certain avoids potential massive blockage due to accidents and the accompanying shouting matches. I especially liked the architecture of this brown building. Stacked in front of it are piles of lumber painted blue on the ends, but I have no idea what the building was originally constructed for. Building regulations do not seem to be very strictly enforced, and so there is a lot more variety in Cairene buildings than those in San Francisco, where it can take years to obtain a permit to alter a structure. While wandering the old streets of Bulaq with their low buildings, the sight of massive towers and office complexes are never far away. On Friday mornings many shops are closed. As the day heads towards afternoon, people slowly filter into the streets, both for work and leisure. Sometimes it can be difficult to tell the difference, as shopkeepers will often sit outside their shop with a glass of tea and a cigarette, chatting with the neighbors as they observe the street and wait for customers. Bulaq is not a highly tourist-traversed neighborhood, and so the four of us made an unusual sight walking around snapping photos. Mot people were friendly and unobtrusive, although there were a few negative comments. There were also a number of people who did not want their photo taken, so do be sure to always ask permission before photographing people. 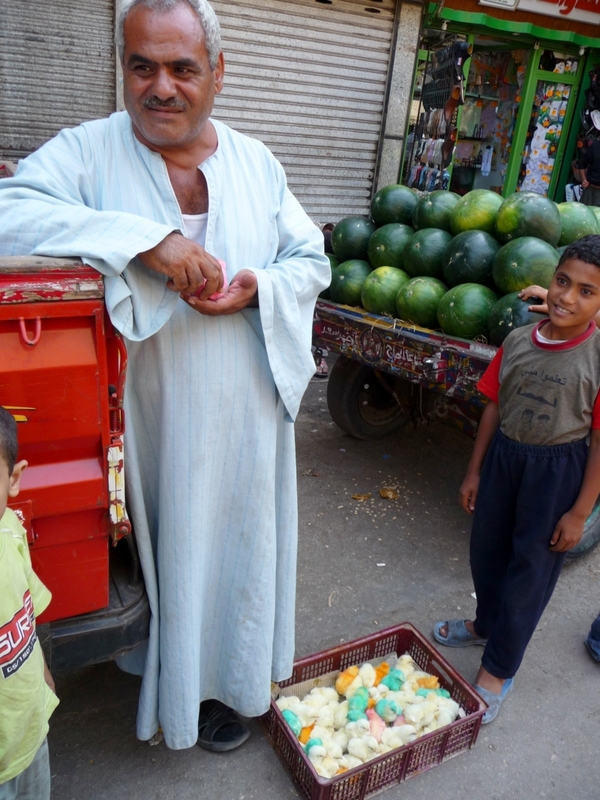 One young girl set up behind a cart of bright watermelons made a lovely scene, but when I asked permission to photograph her I was admonished with a wagging finger and a smile as she loudly proclaimed “no photo, no photo” a few times. In a city where many apartments do not have gas lines and there is a thriving sidewalk food-and-tea stand industry, many people use portable tanks of gas for cooking. 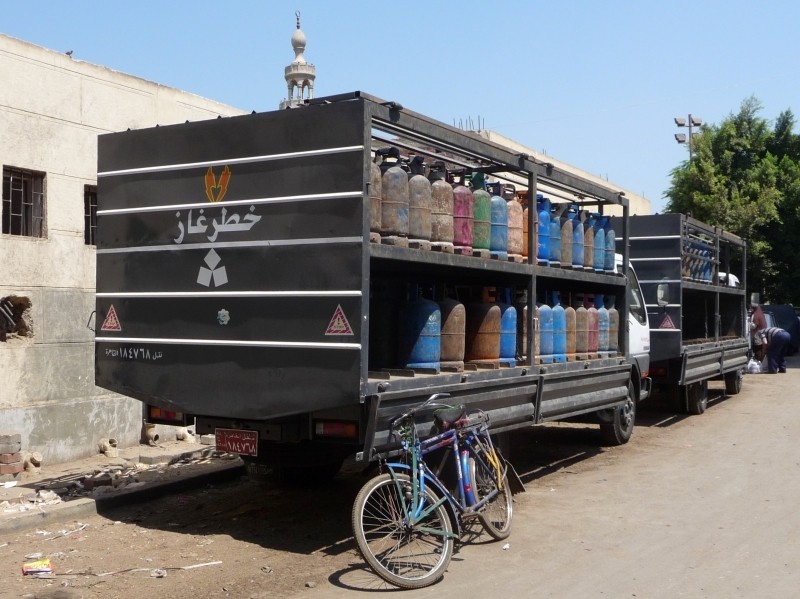 The large trucks like the one below bring the gas to a distribution center, where vendors with bicycles will strap a few tanks to their bike and ride through neighborhoods dispensing the canisters to customers. You can always tell when the gas tank man is coming around, because they make a very distinctive clank-clank-clank sound as they tap the canisters with a metal too to announce their arrival. The person requiring gas would then shout from the window to the vendor or run quickly down to the street to make their purchase. Lo and behold, here is a photo of the gas tank in action. 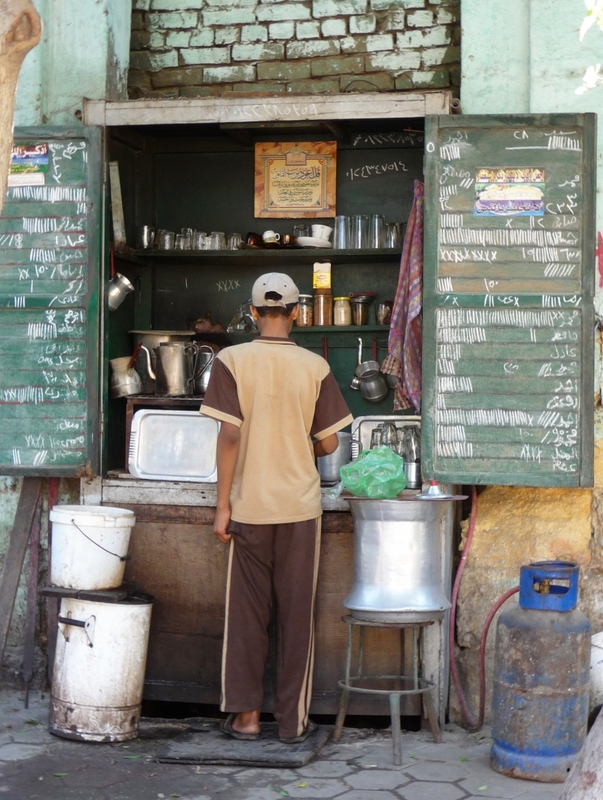 This is a little street-side tea and coffee vendor, with a shop that folds up like a cabinet when not in use. Paper to-go cups are only used in more expensive coffee shops like Costa and Cilantro; local setups like this cater to people within walking distance and use glass cups which they wash and reuse. You find the same thing at juice stands, where they offer juices by the glass or you can bring in an empty water bottle to fill up and take away. Given the high volume of tea drunk on the streets, this really saves a lot of wasted garbage and cuts overhead costs for the vendor. The marking on the doors is, as far as I can tell, a register of tabs for different individuals. The young boy preparing the tea is probably part of the family that owns or runs this stand, and it is quite common to see young children helping out in a family business. There are undoubtedly more dangerous and destabilizing examples of child labor that take place in Egypt (research children working in brick factories, cotton fields or selling items at intersections to see how pervasive and disturbing this trend is), but for the most part the tea stand seem to be the domain of adults where children help out occasionally. 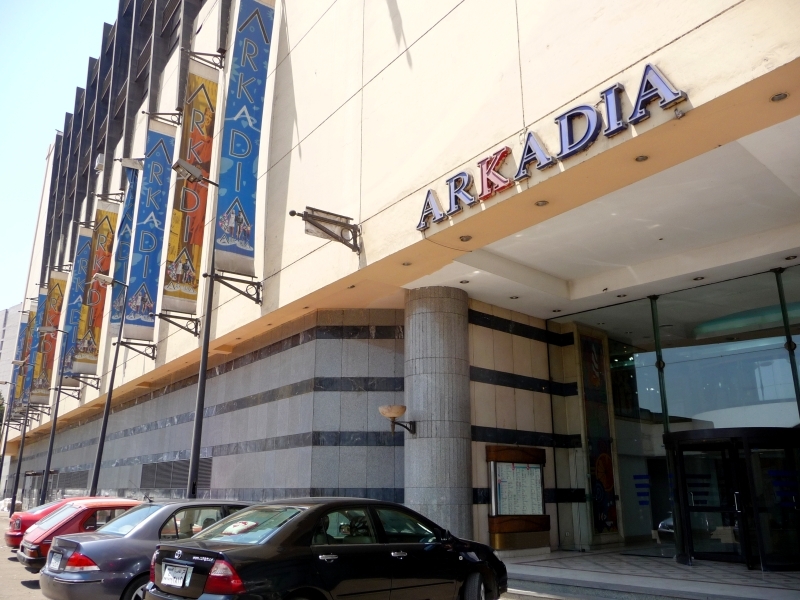 Here is the giant mall in Bulaq, the Arkadia. I don’t have any photos of the inside (although Karem took some great ones), mostly because I felt like we had entered a wormhole and been transported to an alternate plane of dark, stuffy, consumerism. Or maybe, it was just the first time I’ve been inside a mall in two years. Anyways, the absolute lack of customers anywhere inside the mall was in stark contrast to the bustling market outside, and indicates the incongruent position of the mall within the neighborhood it resides. Really, there was nobody shopping in Arkadia, only the employees hanging around looking bored. Perhaps the mall gets busier on a weekday, when people working in the nearby office buildings are in the area. Construction is still going on in Bulaq, although the insane frenzy of building outside of Cairo proper may slow this trend in the future. On a side note, I like the photo below because it shows how within a single group of people, women can wear anything from full niqab to hijab to uncovered hair. As we were walking away from the mall, this group discharged from two taxis and proceeded to walk towards one of the skyscrapers. The woman talking to the man in the blue shirt actually removed her niqab face covering and put on large sunglasses. If you ever live in a Muslim country, you will quickly discover that the issue of women’s garments is far more nuanced and personal that an outsider might think. The Nile, as seen from Bulaq today. 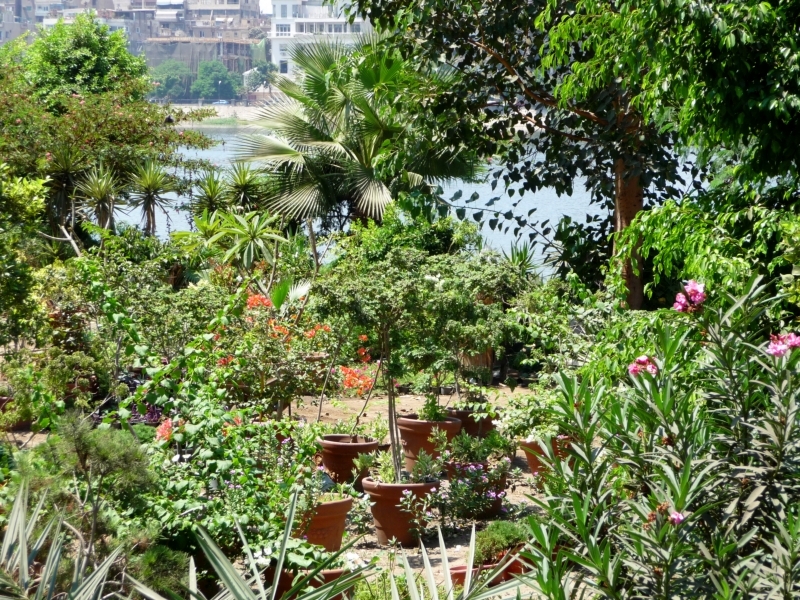 A common sight along the banks of the Nile is a small nursery garden with pots and pots of plants and flowers of all sizes for sale. 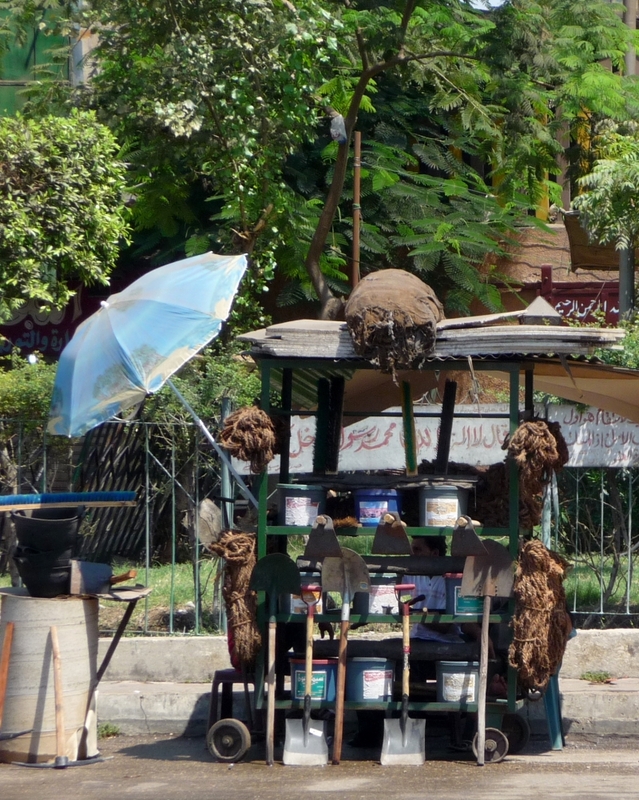 You can purchase anything from a jasmine seedling to a full fledged palm tree along the Nile, and sometimes I see delivery men with plants strapped to the backs of their bicycles pedaling to a customer’s residence. 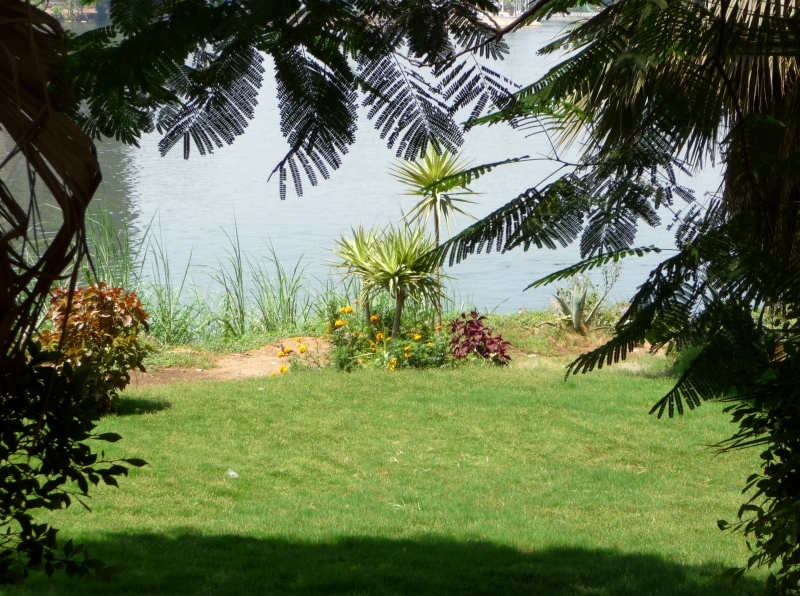 I always though that running a river-side nursery in Cairo would be an agreeable job; one well suited to avoiding the boredom and monotony of an office building. Here is the owner of this particular nursery, dozing in the warm shade of a summer afternoon. Our walk finished here; with the day quickly getting into the mid 30s/upper 90s it was time to retreat from the sunshine. Before we jumped into a taxi to return to the island, however, I did come across a lovely little patch of Nile-side grass which will be a perfect spot for my next picnic. And that, dear readers, is just a little taste of Bulaq (Boulaq, Bulak, Boulak, Bulac, Boulac)! A few weeks ago, Adham, his good friend Amr, and I spent a few days at a villa in a town called Fayid (or Fayed) on the Great Bitter Lake. The Great Bitter Lake, besides having a fantastic name, is a little spot of tranquility just under one hour outside of Cairo. It is a saltwater lake, hence the moniker ‘Bitter’, formed by the Suez Canal and it serves as a waiting area for tankers and ships as they travel along one of the most incredible achievements of the nineteenth century. Fayed is a small town on the lake, and in the photo below it is on the southwestern side of the lake. 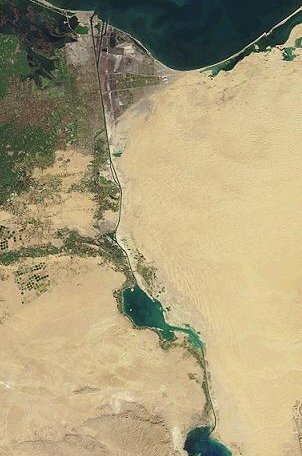 The body of water at the top of the photo is the Mediterranean Sea, and the water at the bottom of the photo is the Gulf of Suez, which leads into the Red Sea. Fayid is close to number of military barracks, and when the town was first built the military offered veterans excellent deals on housing. Many Cairenes, if they can afford to, take a flat in Cairo and a flat somewhere near the water, mainly along the North Coast or the Gulf of Suez, which is used to escape the oppressive summer heat in the city. In the 1970s and 1980s Fayid was a very popular day excursion or weekend destination for Cairenes, but today, due to increased building and marketing in other vacation spots, Fayid is not as popular as it once was. Amr has a friend whose family owns a villa on the lake. When this friend was young the villa was in regular use, but since then the villa has been left in the hands of caretakers. The pool was drained, and much of the furniture removed. Nevertheless, as you will see, it is still an amazing complex! We left Cairo on a Tuesday afternoon, and as you can see from the photo below we were definitely heading in the right direction. 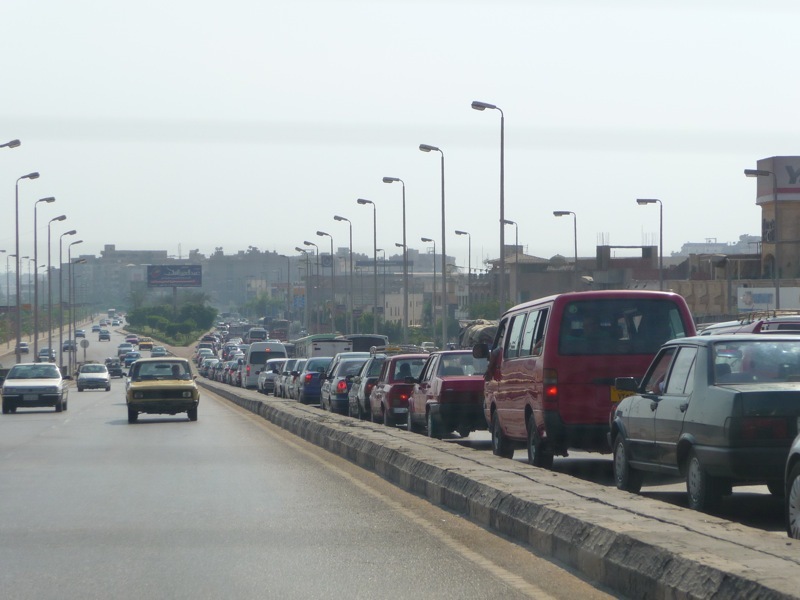 The traffic in and around Cairo from 2pm until 6pm comes to a standstil in many places. 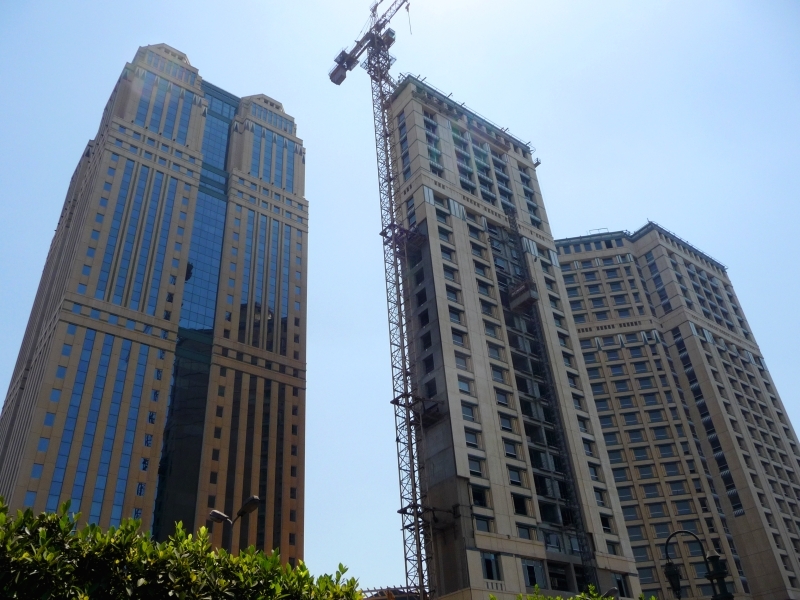 Once you leave Cairo and the surrounding environs, the forests of buildings quickly turn to vast expanses of desert. It is in these areas that developers are starting to build suburban-style complexes, business mega-centers, schools, and factories. The Egyptian government owns most of the land, and you will often see military facilities as well. 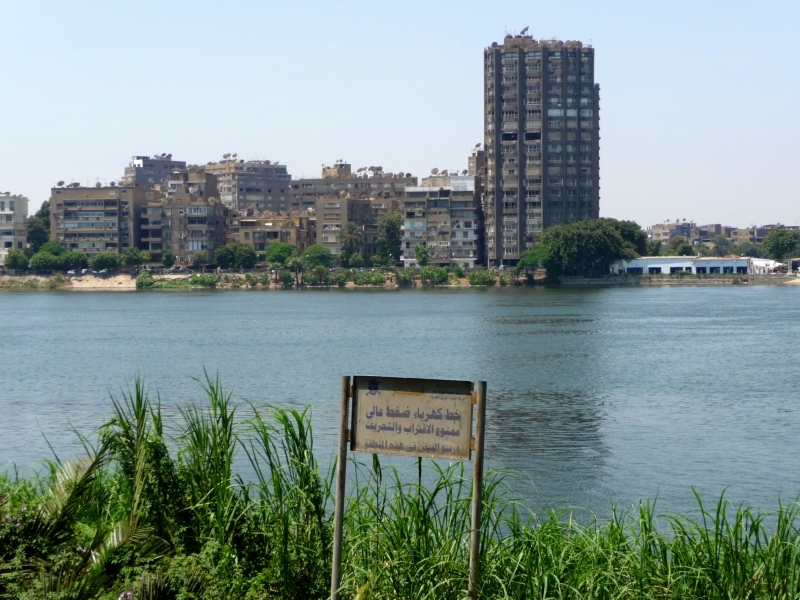 The new campus for the American University in Cairo is located in an area like this, named New Cairo, nearly an hour outside of downtown Cairo. As these areas often have limited public transport accessibility, it can create great difficulties and exacerbate the difference between elite Egyptians who have easy access to cars and benzene, and poorer Cairenes who rely on the bus and metro. The Mugama, one of my favorite and one of the most convoluted (architecturally and bureaucratically) buildings in downtown Cairo, will eventually move to the outskirts of Cairo as well. The Mugama houses the bulk of the Ministry of Interior’s departments, and truly deserves a full post of its own (forthcoming). Most Egyptians and foreigners I have met have had business at the Mugama, and on any given day between the hours of 8am and 2pm there is a constant stream of Egyptians, bewildered tourists extending visas, and foreign residents and refugees applying for or renewing residency visas. I cannot imagine that taking this fundamental institution out of the center of Cairo (and away from the metro that runs practically beneath it) will be anything but a major fiasco. Many people simply cannot afford the taxi fare to reach the outskirts of Cairo, especially when one typically has to return to the Mugama two or three (or ten) times to complete a single process. 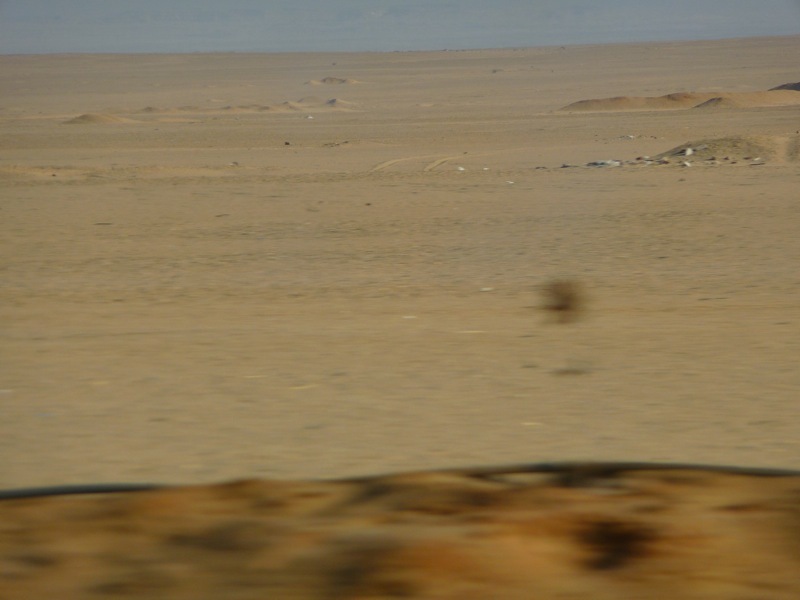 Even the outskirts give way eventually to the desert, which covers 96 percent (yes 96) of Egypt. I love the desert here because it give me the same sense of peace that I feel when looking out across the Pacific Ocean. Tranquility. Quiet. Clean air. Vast expanses of monotony. The biggest sky you’ve ever seen in your live. The most fantastic sunsets and sunrises you’ve ever seen in your life. The way something that never changes can look so different from day to day. Amr’s friend was kind enough to drive us (plus Marley, Adham’s rottweiler) out to the villa where he was going to spend the day and then return to Cairo. 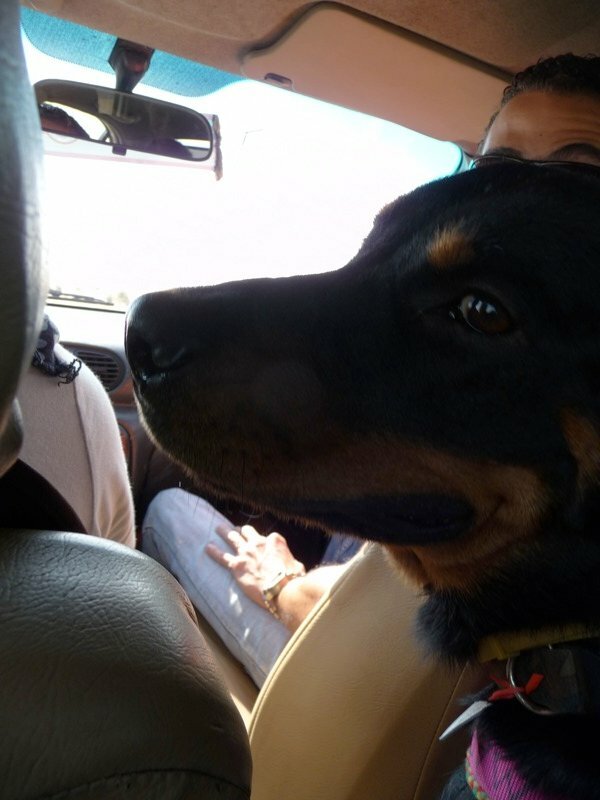 Marley did not enjoy the ride very much, as the car was compact and the temperature outside in the mid-30s. I think in this photo he is reproaching me for pulling him away from the air conditioner, but a big dog drooling on the driver is not exactly an ideal driving scenario. 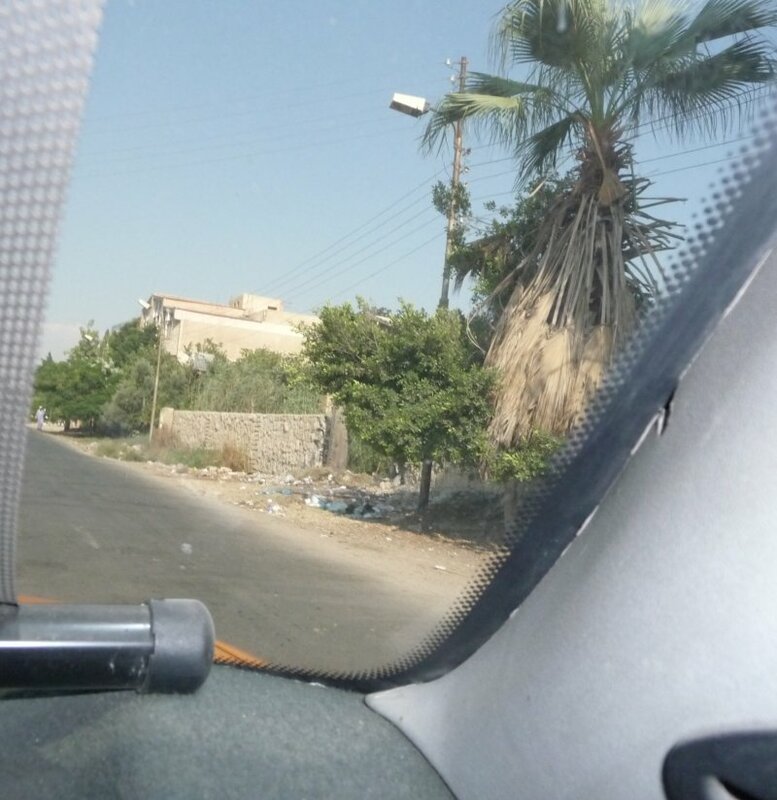 This photo was actually taken as we were leaving the villa, but it shows the street in front. The tall building after the stone wall was our home for three relaxing days. Fayid is a small town that caters to both the surrounding military and vacationers, and as you drive down the main road there are numerous food and dry-good shops with brightly colored water toys and flip-flops (ship-ship in Arabic) strung about. Lebanon has a pretty famous reputation for shiny female pop singers. Elizabeth knows what I’m talking about! Here are a couple of my (our) favorite videos. If you like bling, pink rollerblades, bubble guns, fast cars, windblown hair, purple spandex, gorgeous tabla drumming, and bound men hanging upside-down in water tanks, then you are in for a world of awesomeness. Enjoy! The issue of the hijab is always an interesting one to people, both inside and outside of Muslim countries. I think that one can only understand the complexity of this issue by spending an extended period of time in a place like Cairo, and seeing firsthand the multitude of ways in which both men and women interpret and exhibit ideas of modesty and religion. 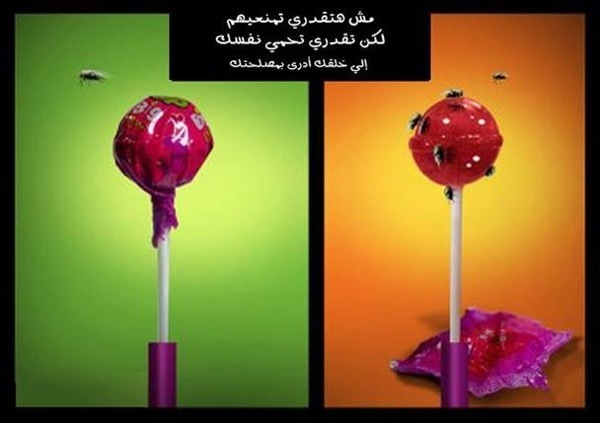 That being said, there has been a flurry of media going around Cairo lately about harassment and the veil. 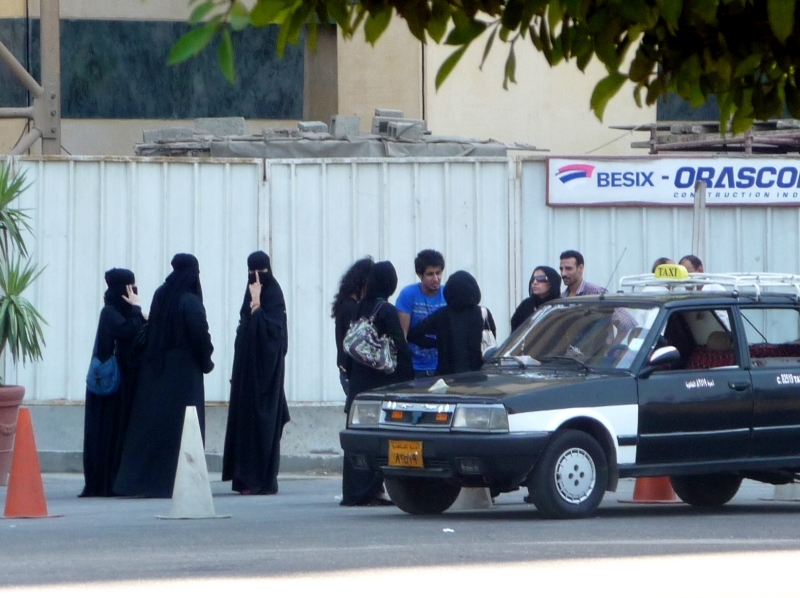 Harassment on the street in Cairo is extensive, and both foreign and Egyptian women experience it. Typically it is through spoken words or gestures, but I known a few women who were touched or groped. The most aggressive harassments I have heard or read about were against Arab Muslim women. There have been two extreme incidents since I arrived in Cairo, and both involved a large group of men harassing women. This is especially scary because in a situation where there are a number of aggressors, sympathetic observers are unlikely to go up against a mob and things quickly get out of control. In both cases muhijaba and muniqaba women were victims, and in one case the Ministry of Interior denies the event ever happened. 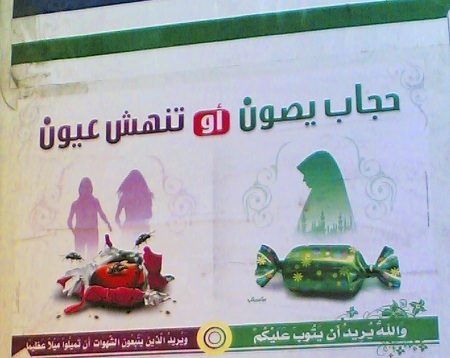 I find these images problematic, because while they reinforce the idea that a muhijaba is clean, whole, and untouched, they make it very clear that an unveiled woman is spoiled, trash. Will this justify men’s harassment of unveiled women, and perhaps intensify it? The pink woman on the far left in the first advertisment could be modeled after the women in these photos- muhijaba but wearing pants and/or fitted clothing. So perhaps is it no longer enough to simply cover one’s hair, one must adopt loose, conservative clothing too. It’s the same, standard excuses for harassment we see all over the world. 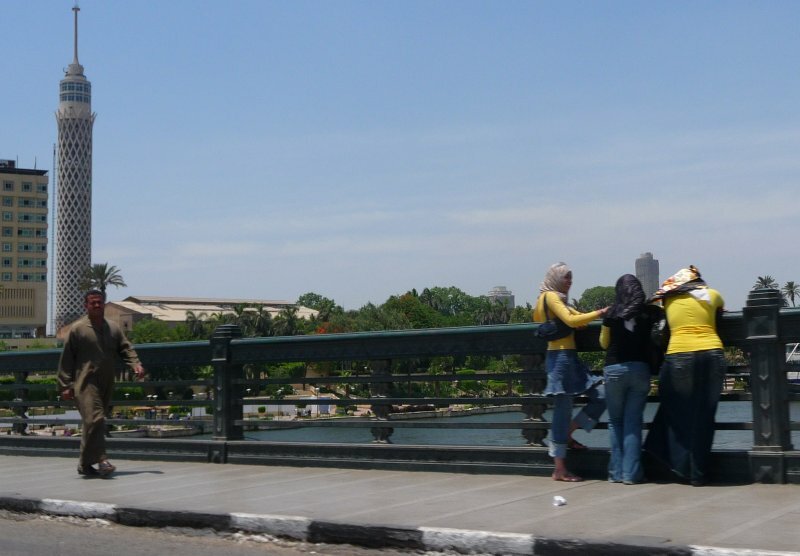 Hardly any women report sexual harassment in Cairo. For an Egyptian woman, it is often assumed (even by the police) that she brought it upon herself. Tourists rarely make the effort, since they will be leaving and the police process is long and complicated, and expats who live here know that there can be severe repercussions for any Egyptian who is brought before the Tourist Police. Egypt takes the tourist industry very seriously and does not look kindly upon those accused of anything by a foreigner. (Note: The WP article claims that the majority of foreign women are harassed by policemen or security officials, something I personally found surprising as my few interactions with policemen and officials have been fine.) The problem is not in the amount of flesh women expose but in the manner in which young men think it is acceptable to talk to strange women. For these men, there are no repercussions, therefore why stop? I have heard talk of a proposed anti-harassment law in Egypt. That’s great, but if you can’t get anyone to point a finger, how will you prosecute? If this law goes into effect, I hope there will be corresponding movements to de-criminalize the reporting of harassment. And finally, I will point out that the oriental dancers and prostitutes in lower class areas wear hijab as they go to and from work. The hijab does not necessarily indicate a particular stance towards religion. There are a hundred different reasons women wear hijab, but avoiding harassment is apparently not one of them. I am going to assume that the Associated Press photographer who took the photo spoke to the women pictured and they are Egyptian as credited; it would be disappointing if the photographer simply snapped the photo and applied an arbitrary label without fact checking. And finally, I just want to remind people who are unfamiliar with the niqab that the cloth covering a woman’s face does not mean that she is not a lovely, personable, individual. I am a non-Muslim American who wears jeans and t-shirts, and I have had many friendly exchanges with women wearing niqab: from joking while waiting in line at the market to questions about directions, from laughing about the antics of the chimpanzees at the zoo to meeting potential landladies. Don’t make assumptions about people who dress different from you and just be polite and normal, regardless of what you both choose to cover your bodies with. 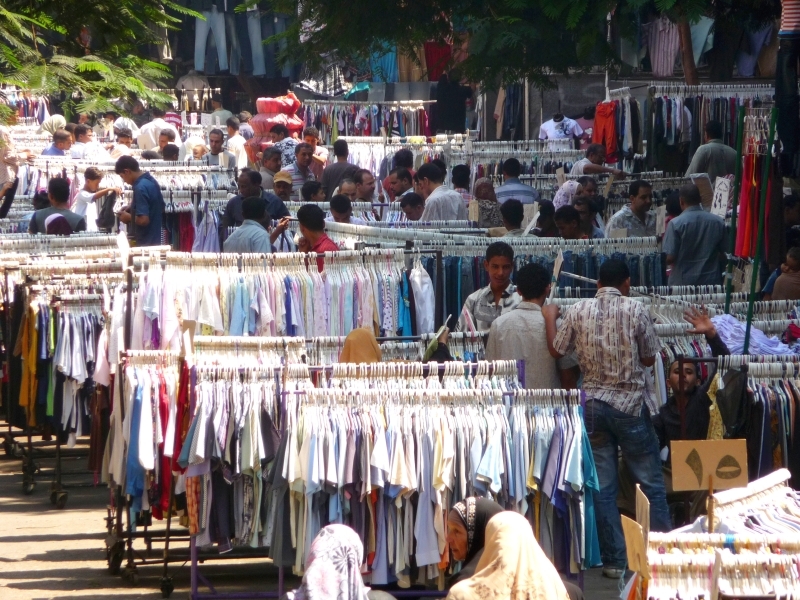 For our first trip around Cairo, we’re going to the Friday Market near the Citadel. 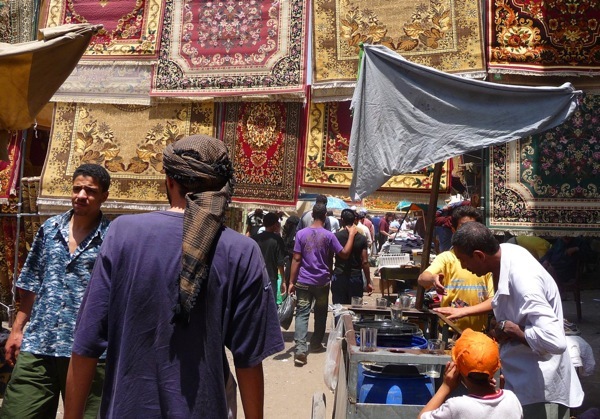 In Arabic, suq means (open) market and ‘ala means castle. Adham took me early one morning, and I wore fairly loose clothes and a hijab (headscarf to cover my hair). It is not really a tourist attraction, and on the day we went I saw no tourists (other than myself!) and it was just people going about their Friday morning routine. The suq reminded me of the old flea market in Sausalito, as well as Porta Portese in Rome. Anything your heart desires can be found in this market, from baby carriages to rottweilers. 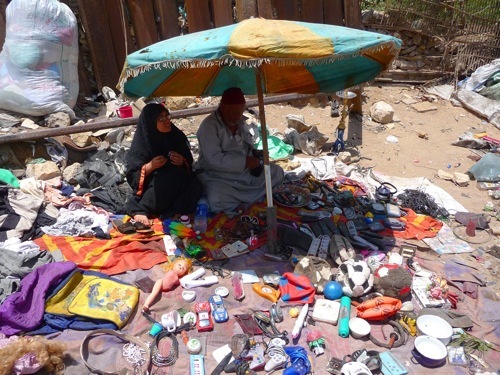 This couple was the first shop as we entered the suq. Notice the sheesha (hookah) to the man’s right, and the radio he is fixing. 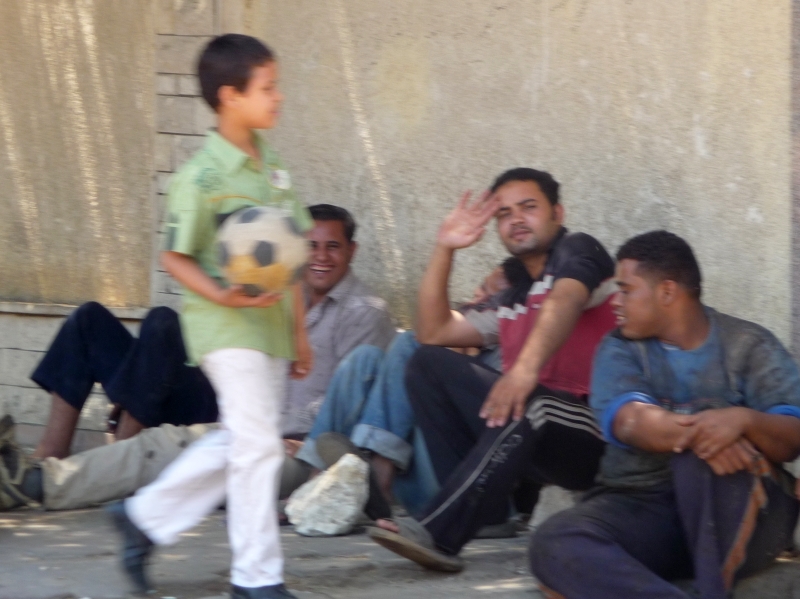 Children in Cairo are often treated more like adults than in the States. Young boys run around the streets delivering tea and sheesha, and it gives me eternal amusement to watch them perfectly mimic adults in their speaking styles and hand gestures. The idea that children should be in bed by 8pm is not a common one, and I often see families (complete with toddlers and carriages) at restaurants, sweet shops, and window shopping at one in the morning. this one is for dad! This vendor was especially tidy in setting up this tool display. 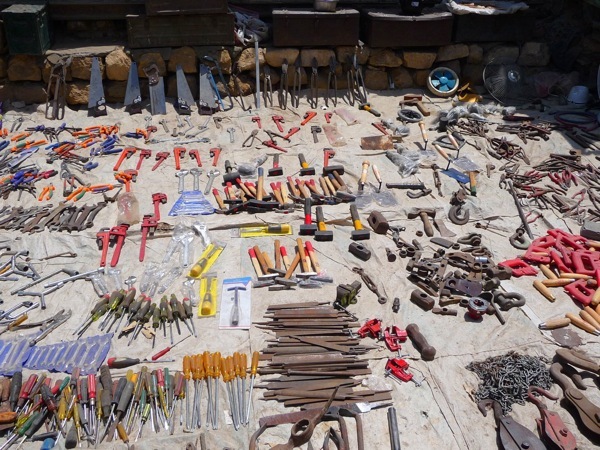 Assorted screwdrivers, saws, pliers, cool bolts, hooks and locks; perhaps this vendor has a shop in Cairo and makes a special trip to the suq. Toys for tots and some pretty slick tricycles. There were plenty of Egyptian women at the market, although the overwelming majority was male (not unusual at all). These women are wearing very typical muhijaba clothing: long, dark and loose. In addition they are wearing full outfits underneath the black outergarments, and it was at least 80 degrees this day! Hello everyone, I have finally started a website so I can share photos and stories with you all! I will try to keep it updated a much as I can. This way you can check in if you like to see what I’ve been up to. Well, here goes!